It’s pretty much a foregone conclusion. The Harekaze has no real chance of taking on the bigger and battelshipier, Musashi. It’s virus-ridden to boot, so that means in addition to her students being all battle-happy, what electronics and communications you have, the closer you get to it, is going to go haywire. Limited options all told the closer it gets to shore. So in picking up where we left off last week, Misaki has found her courage and is going to mount the best offense they can. Now at the outset that’s just a stalling tactic, a ploy that actually pays out dividends they just don’t know it yet. Which is retrospect means everyone gets a go at the action and the main ensemble characters are the actual heroes – good scripting show! I mean, they never came out and explained it as such, but they could at least draw some fire and reduce the number of shells in play with the bigger ship, or as the case would really turn out…add a few more fun options to the mix! So of course it’s the dramatic return of the Tenjin, and the Admiral Spee, was there ever any doubt about that. But also we have to add the school’s other ships, as the Hiei, the Hamekaze and the Maikaze come back into full service and full support. Buying time does pay off, so that puts a sharp underline on bold actions. After that it was everything as it needs to be. The captain coming up with the plan, the XO giving the orders (to get the best of her, you got to lean on Rin), and the crew following to the best of ability. They took advantage of the Y-467’s speed and maneuverability, to get them in close to board the rogue battleship. …and they were surprised by the end of this show how now? Of course there has to be give and take in a battle. We have the lovely smoke rocket cooked up by Coco (Fanuficu-chan) and the gunnery crew, of Mei and Tama, doing a great job. But it looks like the damage the Harekaze sustained earlier that flooded it, was enough to take out rudder control. There goes the maneuverability, and Rin’s last shot to look super-cool at the wheel. 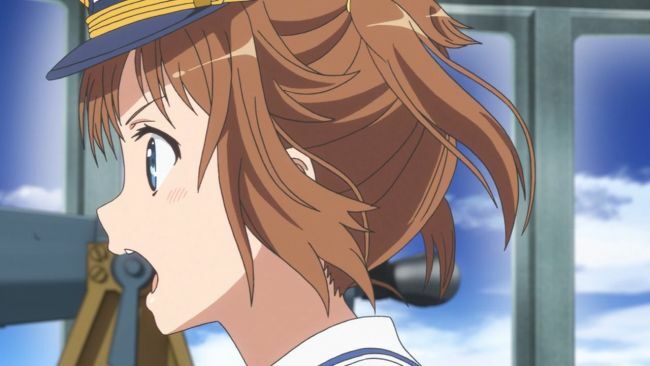 But some fast and crazy thinking by the captain, some of her patented luck and pluck only this time with parachute steering– a hark back to the third episode’s guile and pluck, really does pay off in the end as they are able to get within boarding distance and get the job done. It was pretty short order from there, we saw what they could do on the Spee’s crew, so this episodes direction just took that as written already. Besides, getting Misaki to Moka-chan was the most important part here. So all are rescued, and we get the happy ending. But at a price? It’s really hard to pick a favorite! As if there was any doubt they’d be back! I have to admit I as quite surprised to witness the ultimate fate of the good ship Harekaze. But it was right there in the entire show, wasn’t it. That damage to the hull, the damn the torpedoes approach which Maron fully endorsed, and then getting to boarding distance at that speed stack up to one sunk ship. That it made it to the dock and the crew was able to make it to land in safety was not just a miracle, it was good scripting. Haifuri expressed exactly what it wanted to do from it’s very first episode. It did it very well, and I was quite happy for the past three months, both watching and covering. I didn’t think I would ever continue writing for it until the second episode. This was a show that sought to capture the zeitgeist of it’s machine and girl predecessors. Now there is plenty of room for debate, I’ll leave my two cents here: While I don’t think it’s quite as well structured as Girls und Panzer, nor was it quite as insane and fanservicey as Strike Witches, I honestly feel that it very much did hit that zeit’s strike-zone. It very much belongs in that camp as it was just as much a joy to watch as those show are. I’m very hopeful for a series two, as I would love to see them actually explore that world they developed. Would it be with a resurrected Harekaze? Another aspect? Who knows? But I think it would receive a warm welcome. …and the show ends with the corvette ship literally sinking…MEH XD!! Well i guess that it! to be honest it’s a really good show, but then again there is a lot of scrutiny need to discuss. – Plot Development, i wonder that who brought the “infected mice” on every ships in the first place. Maybe there is some individual out there that they call themselves “pirates”, and THAT would be the real villains of the show, but it simply did not happen!! – and as i said before, The Lack of Military Machinery (Probably the Biggest Flaw), this is somehow kinda weary me, every military needs any kind of aircraft (including helicopters), but on this show, i mean seriously why i don’t see one! apart form some mini-blimp drones, also there is no Aircraft Carriers and somehow they converted into battleship or some sort! AAW It’s Kinda pity, does any one of the staff of this show do something to fix about this kind of situation…uh…I guess it’s Too Late!! Yep, they went for a symbolic ending. They girls had a growing experience, and that means the “catalyst” of the Y-467 had to be “burned away” in the process. Sure it doesn’t make literal sense. It’s a story, it doesn’t have to make literal sense. That’s what news stations are for; but then again news station have more symbolic BS than most fictional stories, so maybe that comparison isn’t apt. -I disagree. This was an ensemble cast. It had the first among equals, in both Misaki and Shino, with the captain taking the lead. But every other character supported that and filled out all the character requirements as an ensemble. Sure, not everyone got an arc, but that’s a tall order for that many characters. I like they way they worked it here. -The hamster virus was an accident that went out of control. The ship carrying all the little patients zero ran aground, so when other ships came to rescue that ship, the hamsters escaped to them, and so on and so forth to other ships in the fleet. So I’m quite happy they didn’t dumb the show down with some potentially idiotic villain hatching some convoluted dumb plan. It was a compelling and interesting set up, it was investigated, and resolved. The “bad guy” was time and distance, and in the first third of the show it was lack of information and misunderstanding…that’s all it needed. -well they made a world with no aircraft, cause that heightens the isolation and drama. If they could just send a plane out, then that takes away most of the tension. Is that clumsy? Oh hell yeah. But it’s interesting…and weird…and not very well explained….it’s all the crazy stuff. 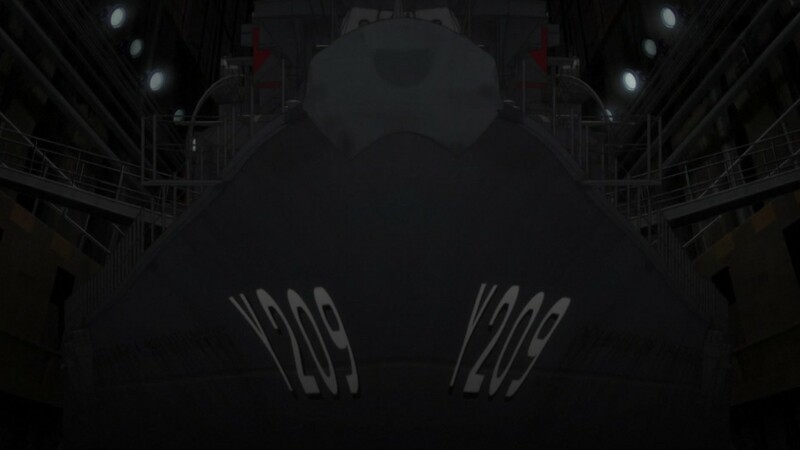 They y-209 is the Takao and is Principal Munetani’s ship. Now in this episode it looks like it had a bare bridge, so maybe they could fill it out with our girls. I like your list, that’s almost perfect. I would swap out Kaede (and the Scarface vid, sorry) for Maron the Engineer. It’s not that Naginata-chan isn’t awesome, she is, but I just like the girl that “keeps the engines purring”. I honestly don’t think Shiro was that unlucky. She liked to put on that affectation, but it was more just trying to blame something else for her problems. Things happen. You get put on a ship with a weird captain. It’s not like that much stuff happened to her, she just liked to make the worst of it. Similar to Touma whining about “Such misfortune”. It’s not about the misfortune. It’s just about the whining. Fun ride. 🙂 Nonsensical in may ways, but still fun. I agree some of it was complete nonsense, and I have to add that in many cases, that is what made it fun. My only regret is that they never took a full dive into the worlds background, such as why they had no planes (you know, other than for story reasons). But that probably would have taken time away from the characters. I liked HaiFlee, but I’ll be honest that I had a hard time remembering who was who, and what made them worth remembering. I couldn’t remember anyone’s name the whole show, and I’m usually the one spouting out names and skylion’s like “Who? I don’t remember names.” I guess they just weren’t visually different enough to let me remember who was who. 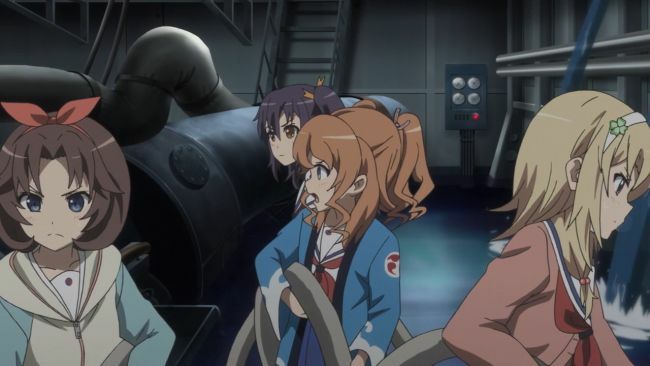 I couldn’t remember the cooking girls unless they were cooking, nor the engine girls unless they were in the engine room, for a couple examples. But the fact that they had one big story arc, that was unexpected from the get-go and stuck with it the whole series really worked. The only thing I think fell flat was Misaki’s paralyzed by worry bit right before the final battle. That felt a little too contrived, in that she hadn’t shown that kind of worry at all before, and now she was incapable of acting because of being worried. I guess it was supposed to show that she was getting closer to the sailors, but it felt too overdone.